To put it simply, we’re a bit obsessive about details, and like time to think through problems. Using the Ikea Home Design tool we were able to sketch out different layouts and play around with where we wanted to put our appliances. Ikea’s tool is accessible through their website, and free, and somewhat easy to use once you get the hang of it – which I found to be two seconds before I gave up completely. 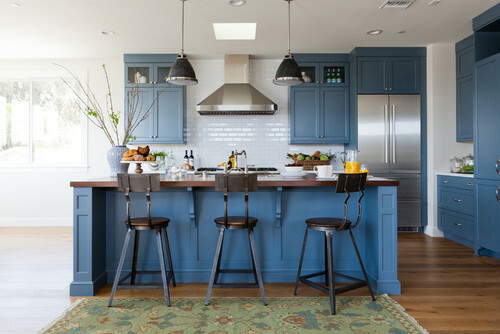 How beautiful is that kitchen? It’s everything. Just one problem: Ikea doesn’t carry blue. And, now only blue would do. 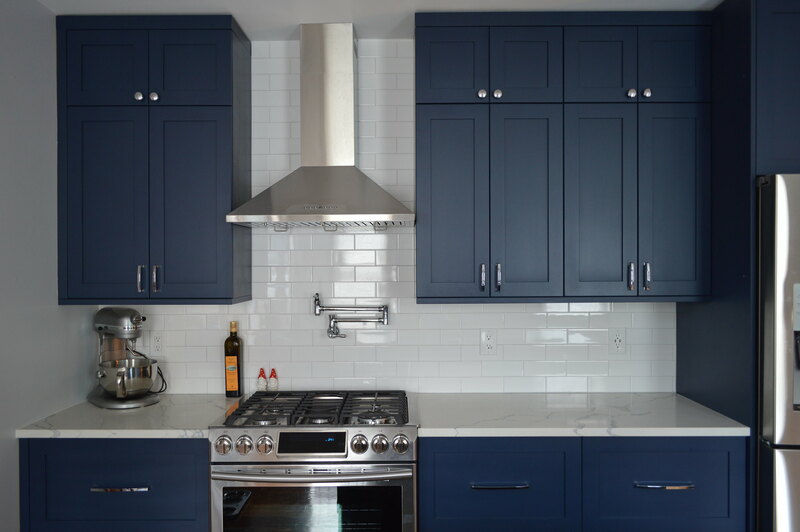 Finding blue cabinets was no easy feat. We started out with trying to find the exact cabinets in this photo, but as it turns out those beauties cost more than a Tesla. We don’t live in Potomac so had to try something different. I could have gone either way, and we were going to go with SemiHandmade up until I started talking more to Scherr’s. Scherr’s, which is a custom shop in Minot, North Dakota, had sent a note asking if I would like them to also quote a custom kitchen build. Meaning, rather than making only the doors for my Ikea cabinets, they could also build the cabinets themselves. All wood, dovetail drawers and all custom sized to fit my exact dimensions. Quotes cost nothing to get, so why not see what it would be? As it turns out, it wasn’t much more expensive than the Ikea, and we would end up with significantly more cabinet space since they would custom fit into my oddly sized room. The cabinets came flat-packed (like Ikea) so our contractor quote already included a carpenter to assemble and install. And, even better: they’d paint them all the exact blue we were going for. 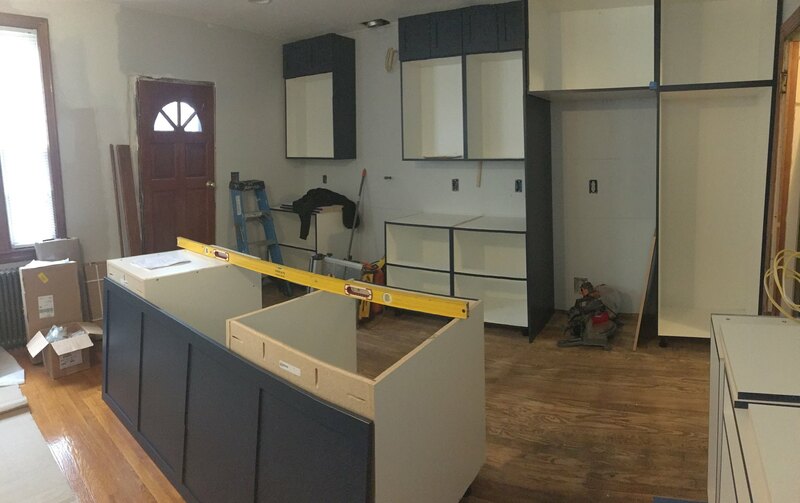 With their expert guidance on finalizing a cabinet design, our contractor’s final measurements and a hefty payment – we had an order placed for our cabinets! The only downside was that since the cabinets were custom ordered, and from a small operation, it took for-ev-er for them to be made. 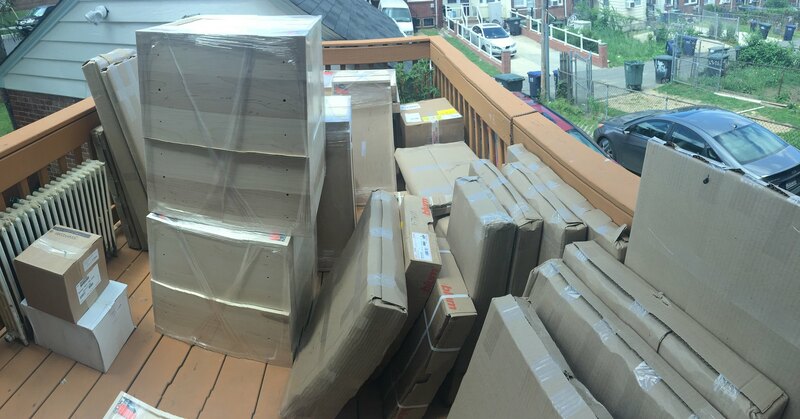 While some people have to wait 2-3 weeks for their cabinets, ours took about 11. Talk about torture. Once they did arrive though, it took only a week or so to get the boxes built and everything put together for the countertops. I’ll tell you what, this was MUCH more stressful than any other part of the project. Cabinets cost a small fortune, and watching a carpenter bang around them is enough to put anyone into a fit of crazy. Every evening I’d been inspecting the cabinets, looking for dings (there were plenty) and sending my contractor questions. On one hand, since the cabinets are built to be “DIY” I wish we had done the DIY for this so that I could control the damage. On the other hand, there is no way Kyle and I could have assembled and installed the trim on the sides, top, and toe kicks as well as a professional carpenter, so it’s best we left the entire job to a professional. As angry as I might be about it all (and still am, months later), I’m glad we didn’t DIY. 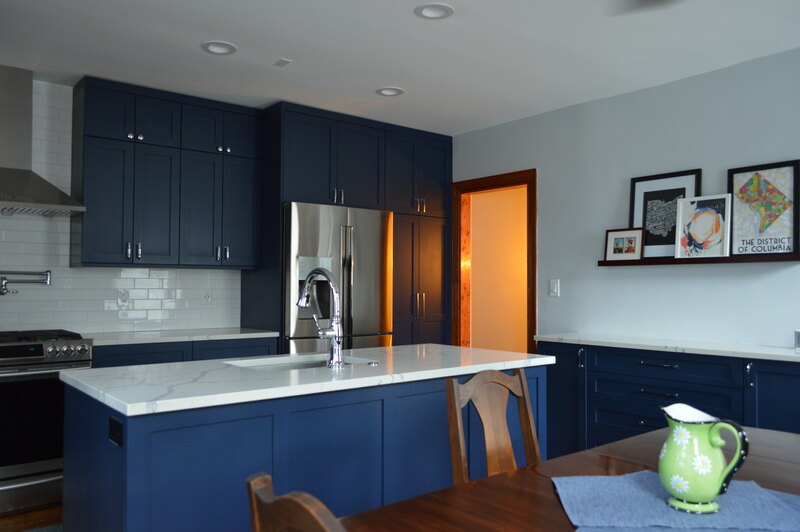 That said, if we had a kitchen cabinet design that didn’t need to extend on both sides to the wall exactly, or to the ceiling as we wanted ours to, we should have DIY-ed the install. 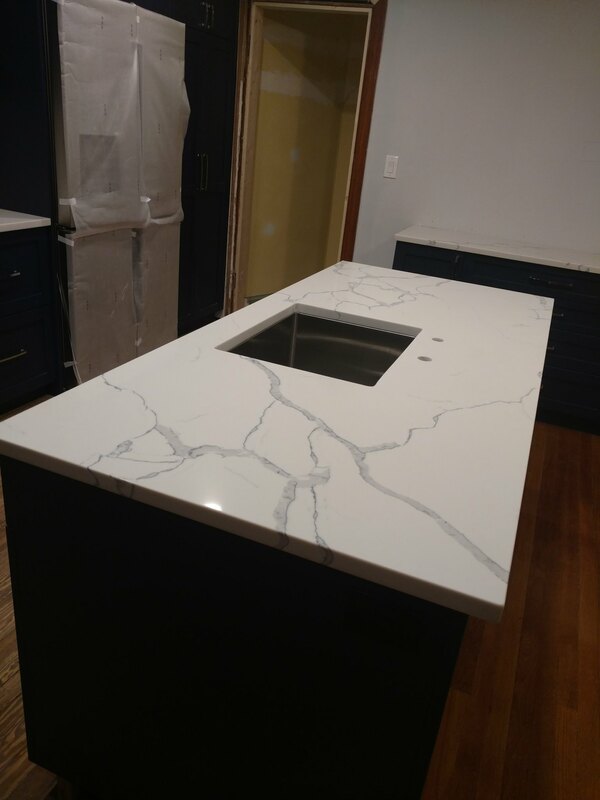 Next in the string of design choices, was our beautiful countertops. These are quartz with a marble look to them, with the marbling blue & grey. After the countertops went in we honestly believed it would just be another week and we’d be able to move out of the living room and start cooking actual meals. We were so wrong. It took weeks until we had plumbing hooked up (correctly), our appliances working, and the backsplash tile installed. This string of events, coupled with the disaster that was our floors is why it’s taken me so long to finish writing this blog post. Arguably the worst weeks of the project, waiting for it to be done and having our contractor disappear for days on end not supervising his workers. We had to have the backsplash tiling redone twice. I won’t say more about it. 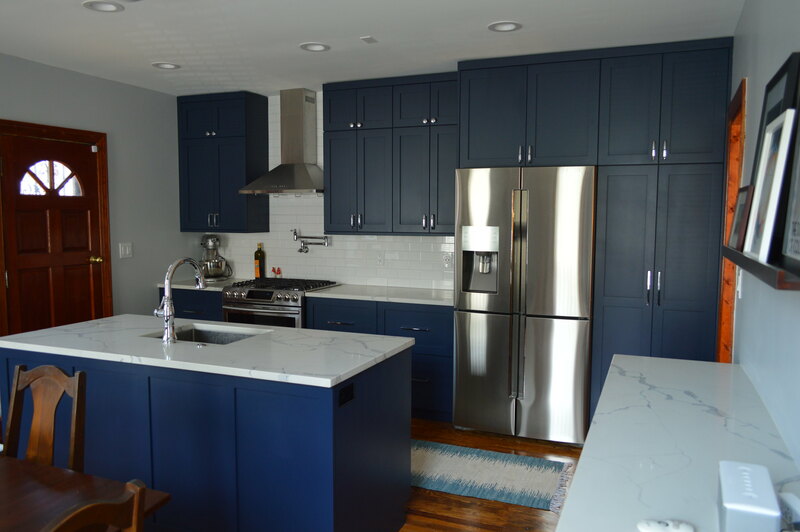 The cabinets are custom painted Sherwin Williams Naval. They’re pretty dark but lighter during the day with the sun coming in, and darker at night. 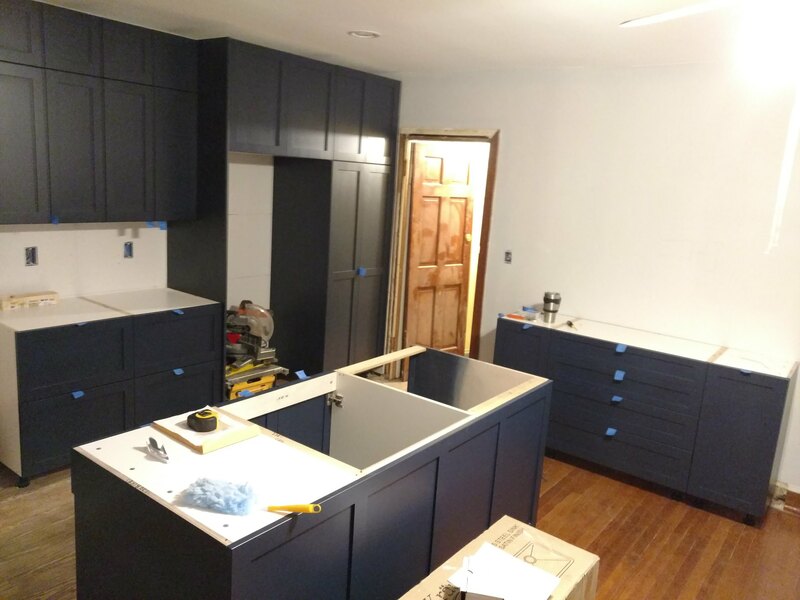 Something I will say about dark cabinets, if anyone would consider getting them, is that it’s not for the faint of heart. Think of them like you would buying a black dresser – any dust or dirt shows. Any nick in the paint, will stand out. You have to be prepared for these things. On that note, I need to go do my weekly wipe-down of the cabinets.